Innovations in spray tan products mean that streaky sunless tans with an unwanted orange cast are a thing of the past. Today's best rated products let you have a safe, natural looking tan with minimal hassle, and many offer extra benefits like anti-aging or moisturizing effects. Named one of the top 20 self tanning products according to lab-tested results from Good Housekeeping, St. Tropez Self Tan Express Bronzing Mist gets top marks for its ability to produce results quickly. Users report getting the perfect level of color with a single use. It's also an Allure Best of Beauty award winner. Its lightweight aerosol formula is easy to apply, it dries quickly, and it is good for all skin types. According to beauty giant Vogue, one of the best products for gradual self tanning is James Read's Coconut Water Tan Mist. This product stands out for its pleasant scent, which is often lacking when it comes to self-tanning products. Color develops within three to five hours, and you can repeat applications to get your desired shade. It's also a winner because of its unique formula that nourishes skin on contact. One of the top-selling sunless tanning products on Amazon, Fake Bake Flawless Darker gets an average rating of over four out of five stars from over 1,100 customers. Reviewers praise the high quality, evenness of the color, depth of the tan and its natural look, as well as how easy it is to apply. It comes with a spray pump and mitt for application, and color develops within four to six hours. The Tinted Self-Tanning Body Mist from well-known beauty brand Sephora is well-reviewed by customers with average star rating of well over four out of five. Reviewers say it gives a nice natural glow, is long-lasting, applies easily, and doesn't leave behind any unpleasant odor. It's also hydrating and doesn't streak. This is best for those looking for a lighter level of tan; most reviewers report it didn't give a dramatic dark tan. Marie Claire gives top marks to the South Seas Skincare Tahitian Mist. It makes their list of top tanning products because it dries quickly and evenly, doesn't streak, and allows you to layer color without darker patches. It also contains nourishing vitamins and is designed to hydrate skin. If you're looking for a top product that's a bargain buy, Allure recommends Neutrogena MicroMist Airbrush Sunless Tan (available at drug stores). It stands out for being easy to use on hard-to-reach places, is noncomedogenic so it won't clog pores, and goes on evenly without obvious streaks. Coola Suncare Organic Sunless Tan Dry Oil Mist is ranked as one of the best sunless tanners by Heavy.com, and it also gets high marks from reviewers. Its formula is a bit different than some other spray products because it's made with a nourishing dry oil. Users report that it's non-irritating for sensitive skin, gives a natural-looking tan, and goes on easily without leaving residue behind. It's also made with organic ingredients and has anti-aging benefits. If you're willing to invest more time and money into your spray tan, at-home systems are available. Though many of these are designed for use by a business, you can also use them to spray tan yourself. Maxi-Mist Lite Plus Sunless Spray Tanning Kit is one of the top systems with excellent ratings from customers on Amazon. Reviewers praise how easy it is to use as well as the beautiful color it produces. 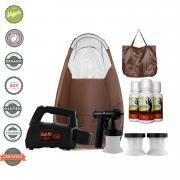 The kit comes with the machine, a pop up tent, and a starter set of tanning spray. The Mystic Tan Self-Tan Spray with Bronzer comes in two-professional looking shades, Island-Kyssed or Mocha-Kyssed, each with different undertones to get the right shade for your skin. Fashion and beauty blog For the Love raves about the product, commenting on the speedy application and perfect color. YouTube reviewers also love it, remarking on the easy application, color, and moisturizing properties. Using a spray tan product on your face can be tricky, but if you're looking for one that promises a natural looking facial tan with a micro-fine spray that goes on evenly, consider Norvell's Venetian Self Tanning Mist for Face. Norvell is a professional brand that also offers sunless products for home use, and they were voted the Industry Choice Award Winner for sunless tanning products according to IST Magazine.